For some days now, G+ has opened its doors to beta testers. 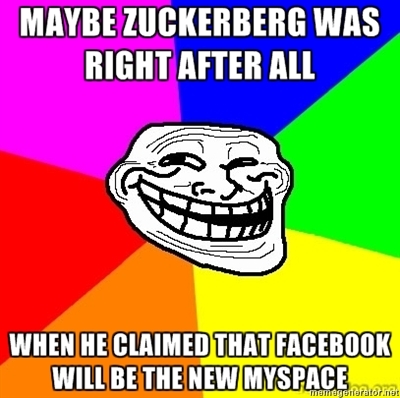 All the people want invitations, and Reddit realized for a long time already that Facebook will be the new MySpace. I had seen some of the freshly-made Google profiles of the avant-garde – that is, technophile persons whose blogs I enjoy from time to time – and was rather impressed of the quality content they posted. So I decided to give it a try. Now this was a major step! G+ would be the first Google product I would use that requires registration. So I went through the process and was eager to try out G+. However, as I had heard already, getting an invite doesn't mean you can use it right away, it might take a day or two. To make a long story short: While waiting for this timespan to elapse, I browsed through various circles. And what I saw struck me as a Facebook for grown ups: People I don't know talking about stuff I don't care about, in a way that might be appropriate in a bar atmosphere, but not to be archived publicly until ... forever or something. A day later I got a second invite, and I could continue to the G+ thing. However, the site that came up told me my browser was not supported (it's FF 3.5). So, it seems I'm not avant-garde enough to use G+. I just deleted my freshly created Google account. I mean, come on, it's sunny outside and there's a pile of unread books waiting! This whole Google jQuery autosuggestion bothers the hell out of me. I mean, why would you use several keystrokes and possibly the mouse to find a page, continuously requesting suggestions in the background? Often I use Google to find a page I can pretty safely identify with some simple keywords. For example, in an IRC conversation I want to give someone a link to Al Jazeera's page about current events in Egypt. Stupid way: 1. fire up browser, 2. enter search terms in address bar (:tabopen in Vimperator), 3. wait for the kilobytes to trickle through the line, 4. find your way around the page, 5. select link, 6. copy it somehow, 7. switch back to IRC window, 8. paste URL. Estimated time amount: ranging from anywhere between 10 seconds to 30 seconds. Clever way: write a shell script to extract "I am feeling lucky" result. head -n 1 | cut -d' ' -f2 | tr -d '\r\n'`"
/home/feh/bin/notify-wrapper "Google 1st result" "$URL"
The notify-wrapper script uses DBus's notify-send to make a little notification box appear as soon as the URL is retrieved (which is, like, instantaneous). Clever way works like this now: 1. Press Mod1-g, 2. enter search term, 3. paste URL. Time you need to find a popular link: Time to type search string + 1 second. Huge time saver.